Each of these breweries brings a refreshing element to North Carolina's beer scene and is well worth a visit. North Carolina’s brewery scene has been growing in size and reputation for several years, with no sign of letting up. At the rate new breweries are opening and established breweries are expanding, you never need an excuse to lift a pint in celebration. A mountain brewery well worth the visit is Waynesville’s Boojum Brewing. In its taproom you’ll see a strange painting of a creature headed into a cave packed with gem-filled demijohns. That’s the Boojum, a creature who liked to imbibe his favorite mountain brew and steal gems from local miners. According to the brewer at Boojum, the inspiration for the brewery came after stumbling upon the Boojum’s footprints and following them to a tasty jug of beer and a recipe hidden in a rock crevice. The brewery’s Balsam Brown Ale is one of the recipes found. Food is also served here – burgers, wings, pretzels and much more – so you can fuel up before you head into the mountains to see if you can find the Boojum’s treasure. This aviation-themed brewery in North Carolina's Brunswick Islands brings fresh-brewed craft beer to this small coastal town for the first time. Check Six Brewing Company has a cozy tasting room decorated with the signature World War I aviation accessories: The bar is shaped like the top wing of a biplane, and along one wall you’ll find the whole nine yards – a 9-yard long machine gun belt like the ones that fed the weapons on those first fighter planes. Almost all the beers here bear the name of some famous WWI ace, plane or personality. There’s the Flying Circus Hefeweizen, named for the Red Baron and his colorful comrades; the Harley Pope Imperial Porter, named for pilot Harley Pope who crashed his plane in the Cape Fear River in 1919; and Dugans Chocolate Stout, a brew named for an Irish-American pilot and one that doesn’t skim on the chocolate. The Belgian farmhouse brews at this South End brewery are created by a pair of brewmasters who met in middle school, but (hopefully) discovered beer a bit later in life. The Wooden Robot taproom has lots of space to spread out and get comfortable as you take a taste-bud tour of southern Belgium, and the kitchen serves a variety of appetizers and sandwiches. Good Morning Vietnam – a coffee vanilla blonde ale – is one of Charlotte's most popular beers, but Wooden Robot also offers a variety of tasty rotating beers. The mountains of North Carolina have long been our beer epicenter, and Lazy Hiker Brewing in Franklin is carrying on that tradition. Lazy Hiker takes its name from the nearby Appalachian Trail and a passion for the outdoors shared by everyone at the brewery. Serving cold brews to hikers, locals and visitors alike, Lazy Hiker’s taproom and brewery are breathing new life into Franklin’s former town hall and fire department, giving plenty of room for equipment and expansion. 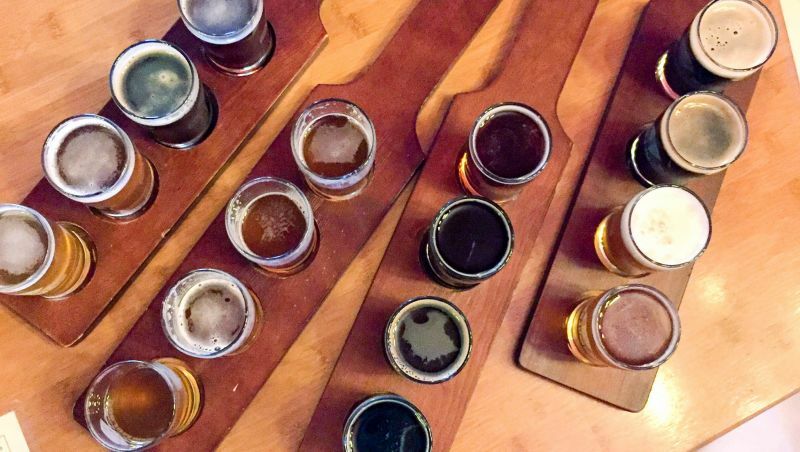 Get a sampler flight or a pint of the easy-drinking Trail Mate Golden Ale and wash the trail dust from your throat. This rustic-chic bar is a beer lover’s dream come true. There’s an astounding amount of beer here, if you consider 366 taps astounding, which is a world record. This Glenwood South beer haven has four bars. Downstairs there’s Spiritual, a high-end spirits bar, and the 144-tap North Carolina bar; upstairs there’s a 222-tap domestic and import bar; on the roof there’s a small bar with a dozen or so taps and a fantastic view of the city. 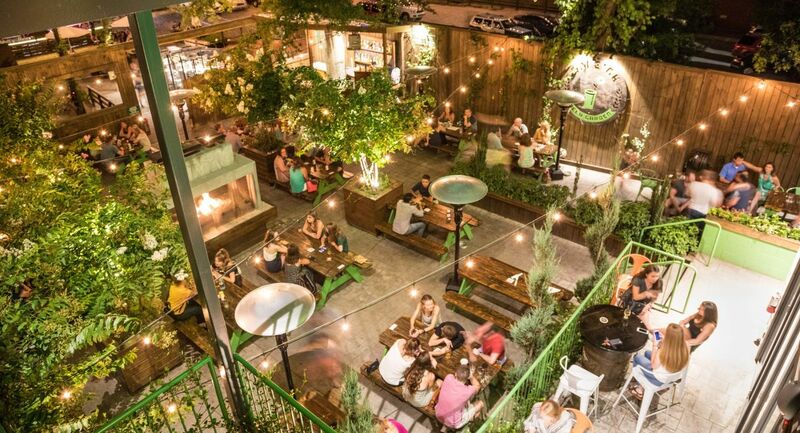 Outdoor space is abundant, and the food at Raleigh Beer Garden – pizzas, chicken wings and the like – is amazing. This spot has a tiny taproom and a little more outdoor space, but its beer is enough to keep you coming back (plus you’ll find it in bars, bottle shops and fellow breweries around town). Broomtail has been brewing since 2004, but at the time it was just for kicks and the setup was in a barn. Since then the brewery has grown up and moved out but kept the equine influence in the name, Broomtail. The Rappe Imperial Stout continues the horse theme, as the brew is as dark as the rappe-colored coat, but it drinks much lighter. The Elysium Bier de Garde is another brew to look for – it’s slightly sweet and malty, with some floral notes thrown in for good measure. This NoDa neighborhood brewery is run by brothers Jeff and Jason Alexander. 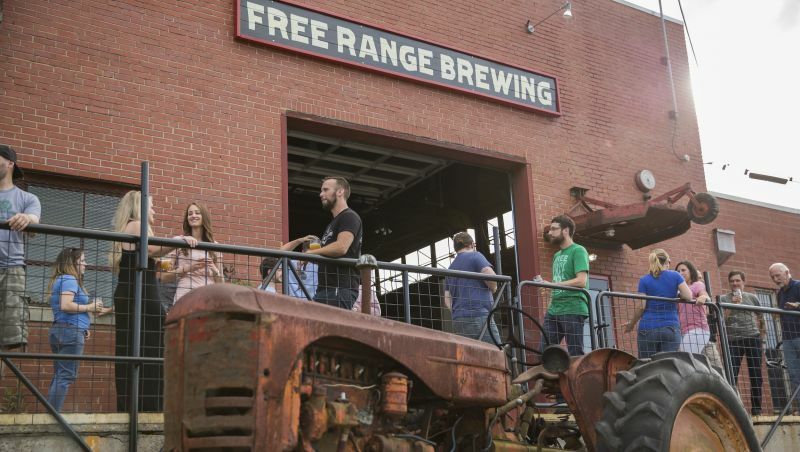 Free Range opened in 2016, and with a great blend of indoor and outdoor seating, it has plenty of room for you to enjoy one of its small-batch brews. What’s on tap changes frequently, but you can’t go wrong with the Sea of Companions Oyster Stout or My Fair Lady, a rotating high-gravity IPA. Named for the four patron saints of beer (Saints Wenceslaus, Nicholas, Luke and Augustine of Hippo, if you’re keeping score), Four Saints Brewing Company brings a broad approach to brewing to central North Carolina. Rather than settle on one style or another, Four Saints is exploring various styles and flavors that intrigue or excite the brewmasters. Among those styles are a Belgian Dubbel and a Hefeweizen, both of which are available year-round; Scottish Ale and a Peach Hefeweizen, both of which are seasonal; and a quartet of beers devoted to each of the four saints and available once a year. Among those saintly, seasonal brews are the St. Augustine Jalapeño Smoked Brown Ale and the St. Luke Honey Ginger Pale Ale. This brewery was founded by four men who shared a love of two things: paddling and beer. After many a mile paddled and many a pint poured, the campfire conversation turned to opening a brewery. Now here they are, four guys who love beer and paddling with a brewery in an old mill near the Catawba River. Rivermen is keeping its selection tight, perfecting six signature brews: a pair of IPAs, an American pale ale, an Irish and Scottish ale, and a honey blonde. Keep an eye on this brewery – it's a natural spot for fall and spring pig pickins, and everyone knows the three things you need for a successful barbecue are a whole hog, some vinegar sauce and cold craft beer. 10 Bull Durham Beer Co.
What’s a trip to Durham without a trip to see the Durham Bulls play baseball? On your next trip to take in a ballgame, grab a beer from Bull Durham Beer Co. For baseball season, the brewery serves a pair of beers, the kolsch and wheat, two beers that are light and crisp and, as they say, drinkable “for nine innings on a hot summer day.” And the taproom? We’ll it’s one that can’t be beat: the Durham Bulls Athletic Park. 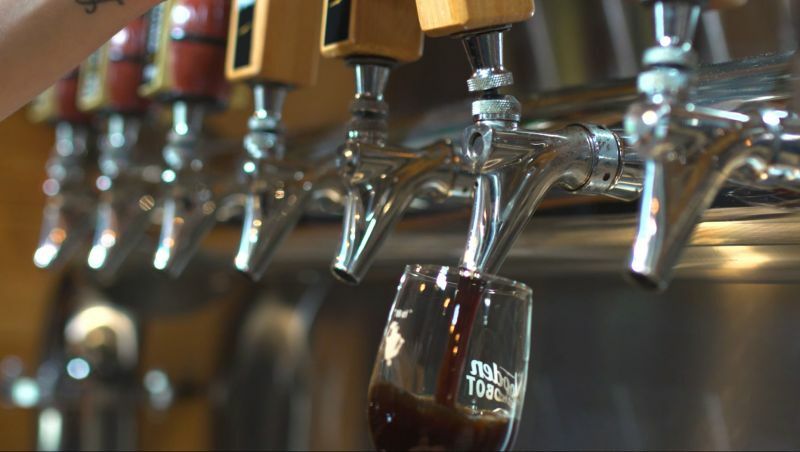 Keeping up with it all can be dizzying, but a couple of resources (besides VisitNC.com) can help you stay on top of all things #NCBeer. The North Carolina Craft Brewers Guild brings brewers together from across the state, and NC Beer Guys are two guys who love beer and have the online presence to prove it.